Group-living animals must constantly integrate and respond to information from other individuals within the group. The degree to which consistent inter-individual behavioural differences are influenced by social cues in such groups is largely unanswered. We used the honey bee waggle dance as an experimental paradigm to explore this question. Honey bee foragers use the waggle dance behaviour to communicate information about food sources in the environment to their nest mates. This recruitment process incorporates information about the food reward, the colony food stores and the environmental food availability and plays a major role in ensuring efficient exploitation of the food sources available to the colony. We first observed individual foragers visiting the same food source and quantified the probability and intensity of their dance activity. We found that there are consistent inter-individual differences in both measures of dance activity within a forager group. Next, we removed foragers and observed that this led to a significant increase in the average dance activity of some foragers. The individuals which increased their dance activity were the ones which were more active before the removal. Finally, we allowed recruits to join the foragers at the food source, which had a strong inhibitory effect on the dance activity of all the individual foragers. Our study shows that a complex interplay between individual behavioural differences and social interactions drives the dance communication needed to effectively organise the colony’s collective foraging behaviour. Very little is known about the effect of social cues and signals on consistent inter-individual differences in behaviour amongst workers in the same colony in social insects. We studied this in the recruitment behaviour of honey bee foragers, the dance communication. 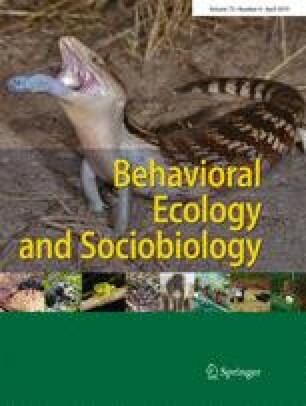 Foragers visiting the same food source consistently differed in their dance activity, suggesting that there were strong inter-individual differences in the perception of the food reward. We then changed the social cues experienced by the foragers by either removing some of the foragers or allowing recruits to forage at the same food source. We found that the removal of some foragers had an individual specific effect, whereas the presence of all recruits affected all foragers. Our results show that the regulation of foraging in honey bees involves the social modulation of consistent differences in recruitment activity. The online version of this article ( https://doi.org/10.1007/s00265-019-2649-0) contains supplementary material, which is available to authorized users. We would like to thank Ravi Kumar Boyapati, Abhishek Anand, Hinal Kharva and other student interns for their help with the behavioural experiments. We would also like to thank Sruthi Unnikrishnan for providing valuable feedback on the manuscript. E.A.G. was supported by a fellowship from National Centre for Biological Sciences—Tata Institute of Fundamental Research; A.B. was supported by National Centre for Biological Sciences—Tata Institute of Fundamental Research institutional funds No. 12P4167.